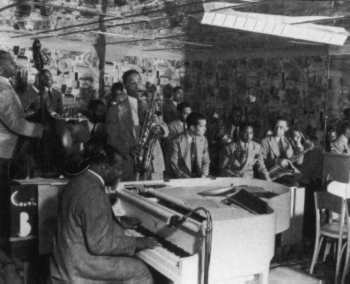 From the very beginning, jazz fans described the music as being either “hot” (with lots of improvisation and variation) or “sweet” (with highly arranged structure and a focus on the main melody). Of course, these terms are not mutually exclusive; both can be found in the same recording, and the rise of big band swing made it increasingly possible to blend the two approaches, taking a tight, basically “sweet” arrangement and adding fiery solos or other exciting “hot” touches. As the following selections show, some bands did this very, very well. Forget Benny Goodman’s legendary concert at Carnegie Hall: his greatest legacy from 1938 is this flawless recording. The song had been written by Chick Webb’s alto sax player Edgar Sampson, and Webb had a hit with it in 1935 (Decca 483). That version is phenomenal, but Goodman’s is immortal. 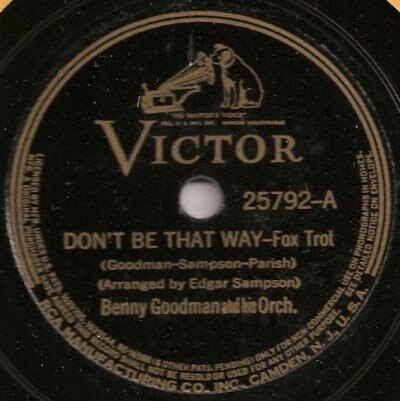 Where Webb and company played the song fast and razor-sharp, Goodman’s band set a somewhat slower pace that allowed them to polish it into a rounder, fuller sound. The entire band is in top form, and every instrument sounds simultaneously spicy and sweet. 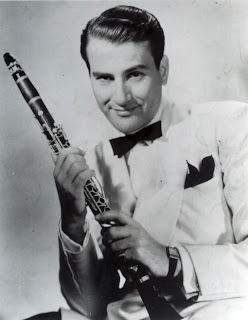 Goodman himself leads the way with one of his best performances on clarinet, three separate solos that lure listeners in with soft tones then hook them with pointed playing that is no less rich. Solos by Harry James on trumpet and Vernon Brown on trombone are also quite good, as is the playing of Jess Stacy on piano and Gene Krupa on drums. This record is more than just a series of individual performances, though, as the ensemble playing is also extremely tight and enjoyable. Just listen to the opening section with the woodwinds playing the same melody octaves apart while the brass instruments add short, staccato accents. Or the way the entire band repeats the theme over and over again at the end, softer and softer until Krupa brings the volume back up with a machine-gun burst of drumming. Classic. The great Artie Shaw was perhaps the only clarinetist of the big band era that could come close to Benny Goodman’s pure, sweet tone. Shaw’s band certainly challenged Goodman’s in popularity as well, and while they tended to have a very polished, sweeter style, they were also very talented and not afraid to experiment. Their rendition of Cole Porter’s “Begin the Beguine” was their first big hit, and it remains one of the most recognizable and delightful gems from the period. (For the record, a “beguine” is a kind of Caribbean dance and is pronounced the same as “begin.”) It is highly arranged, and the solos by Shaw and saxophonist Tony Pastor do little more than express the main melody, but there are just enough “hot” elements to keep it swinging. Most of that is thanks to Shaw himself who adds wonderful, improvised touches in all the right places, including a sliding crescendo that ends the song on a high note. In 1938, Billie Holiday joined Artie Shaw, becoming one of the first African American singers to be featured in a white band. It was a match made in heaven, but unfortunately the extreme racism she faced while touring the South soon made her leave the group. “Any Old Time” was the only recording she made with Shaw, giving us only a hint of what could have been. The band plays beautifully, and Tony Pastor’s solo on tenor sax, while not adventurous, is notable for its marvelously rich tone. But, of course, it is Holiday who steals the show with a performance that rides effortlessly on the gorgeous melody, and yet reaches beyond it thanks to her multidimensional voice. Given Holiday’s incredible versatility, it is revelatory to hear her sing something so straightforward and so joyously pure. Vibraphonist Red Norvo led a compotent, popular big band and had several hit records. He is most known for his excellent work with his wife, singer Mildred Bailey, which earned the couple the nickname “Mr. and Mrs. Jazz.” Bailey was a large woman, but she had a voice that floated as if it had angel wings. She was one of the most popular singers of her day, and her voice remains one of the loveliest in pop music history. “Please be Kind” is a great example. It is a light record, with superbly sweet playing that keeps the song enjoyable without calling too much attention to itself. That leaves more of the spotlight for Bailey, who doesn’t disappoint. With a voice so pure that it embodies innocence, she sings: “This is my first affair / So please be kind / Handle my heart with care / Oh, please be kind!” The record was a major hit, and while it may not be the most technically impressive thing Bailey ever sang, it is so lovely that you can’t help being dazzled by it. Larry Clinton enjoyed much success on the charts, both as a bandleader and as an arranger for others, but his greatest accomplishments came during the two-year tenure of vocalist Bea Wain. “My Reverie” was Clinton’s first #1 under his own name and beautifully displays what has made Wain a favorite among big band-era singers. The first half of the song is a lovely instrumental, a pop adaptation of the classical piano piece “Rêvierie” by Claude Debussy. It is pleasant, pure pop, far removed from “hot” jazz. Wain’s voice, however, is a multidimensional wonder that works on a purely pop level while providing the kind of expressive depth and fluid sense of swing that characterized the best jazz singers. From the moment she begins to sing, everything else is all but irrelevant and her enchanting voice becomes the song. Listen to the ground she covers in just one line: “Without you, life will never begin to be.” Such power in “without” and “begin,” yet such restraint in “you” and “be.” She is behind the beat in the beginning and yet races ahead of it in the end, only to slow down and find her place again. And throughout it all, the timbre of her voice shimmers and evolves, moving from weighty to light-as-a-feather. 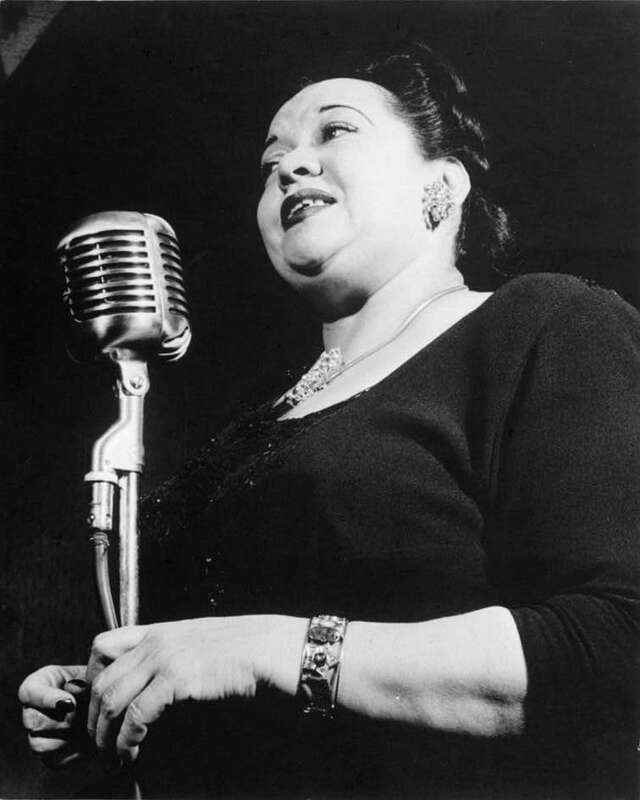 Unlike Billie holiday or Frank Sinatra, Wain’s career did not extend beyond World War II into the era when singers became more well-known than band leaders, so she is not as well known today. But for those who appreciate pure, perfect singing, she is one to look for. This is a great example of how a record can sound soft and “sweet” and yet still feel unpredictably “hot” and exciting. While Lester Young is the better known of the band’s two star tenor sax players, this record is a showcase for Herschel Evans. Evans sets the tone early playing a slow, bluesy solo that fits the song’s title to a T. Other band members then contribute their own bluesy solos: Basie on piano, Ed Lewis on muted trumpet and Lester Young playing clarinet. All of the solos are highly enjoyable, and when the full band enters during the end of Young’s clarinet solo, it adds an almost overwhelming sense of depth and power. Evans then returns on sax while the band continues to play, and as they fade back into the background, Evans’ tender touch brings the record to a beautiful close. Unfortunately, Evans’ greatest moment would be one of his last, as he would die from a heart problem early the next year, just one month shy of his 30th birthday. I always understood that the trombone solo on "Don't be that way" was by Vernon Brown. Red Ballard might have taken the 'straight' solos on records such as "Can't we be friends". Also Humphrey Lyttelton used to attribute the trumpet solo on "Blue & Sentimental" to Ed Lewis who was Basie's lead trumpeter at the time.